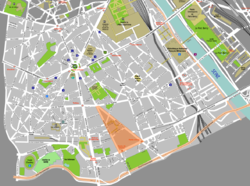 Bercy Village in the 12th arrondissement : where the Parisians relax on week-ends : a pedestrian street with nice shops and trendy restaurants. Also home to a beautiful Park and a gem of a museum : Museum of Fairground Arts. Read more. Around Aligre Market in the 12th arrondissement : A vey lively and cosmopolitan Market, surrounded by great wine bars, restaurants and gourmet shops. Read more. Chinatown in Paris, in the 13th arrondissement : Paris has the largest Asian Community in Europe, 20 000 of them live in our local Chinatown. Read more. Around Canal Saint Martin : An interesting mix of bobos inhabitants, ethnic ommunities, trendy cafés and bars but most importantly a beautiful canal to walk along. Read more. Museum of Decorative Arts, 1st arrondissement : A small museum that has re-opened in 2006 after a 10 year closure, and located in one of the Louvre Museum's aisle. Read more. Museum Nissim de Camondo, 8th arrondissement written by my friend Luc in our communal blog "Our Paris". The private hotel of the "De Camondo" family and all about their tragic history. Read more. Museum Gustave Moreau, 9th arrondissement: written by my friend Luc in our communal blog "Our Paris". An extraordinary museum, home and workshop of Gustave Moreau, a XIXe century painter, precursor of Symbolism. Read more. Museum of Fairground Arts, 12th arrondissement : For me, the most beautiful museum in Paris, worth a visit in itself. A collection of restored merry-go-rounds, fairground shops and attractions, from one of the biggest collections of fairground arts in the world. Read more. The Saga of "La Maison Ladurée": How, from a tiny pastry shop, Ladurée has become the inventor of the famous "macarons" and a successful international Gourmet chain. Read more. Victor Lustig, the man who sold the Eiffel Tower : The hard-to-believe story of a man who actually sold the Eiffel Tower to a naive scrap metal dealer. Read more. The History of Le Printemps Department Store and its renovation program : Read more.